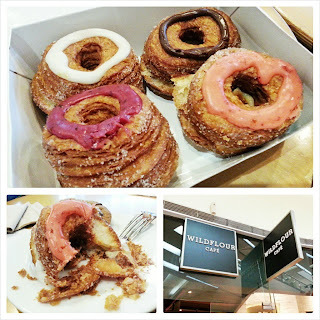 I feel sorry for those who have been fans of Wildflour Café’s breads and pastries before they started offering Dominique Ansel’s creation, the cronut. Now, all most people ever go there for are these croissant-donut hybrids, and if you’re not there for them cronuts, you’re gonna be waiting a long time. I queued at their branch at The Podium at a quarter to one yesterday (because it’s at 1 PM that they serve their afternoon batch of cronuts) and was lucky to have finally gotten my hand at the famed pastries in less than 10 minutes. They only allow a maximum of 4 cronuts per person ordering, so of course to make my wait worth the while, I ordered four different flavors. My verdict: it’s delicious but not something I’d wait in line for hours for (like they do for the original cronuts). You’ll eat a cronut slower because its flakiness makes it hard to slice and fork (though I’ve discovered it’s more enjoyable eaten by hand), plus you’ll feel like it’s worth relishing very slowly, considering the difficulty you went through in obtaining it. So I guess that’s a benefit for those trying to watch their weight. The cronut may fill the void for those who have been looking for something exactly like it, which is a croissant-donut hybrid, but personally, I’m still more of a donut person.